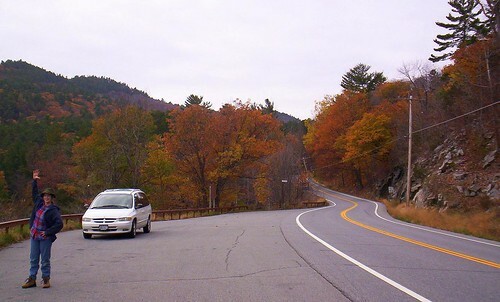 This is a continuation of our autumn 2007 trip to the Lake George area of the Adirondacks. After our failed excursion to Fort Ticonderoga, we hankered for a real adventure. We drove around the small town of Ticonderoga (nicknamed “Ti” by the businessfolk and evidenced by their proprietor’s signs: Ti Barbershop, Ti Pizza). 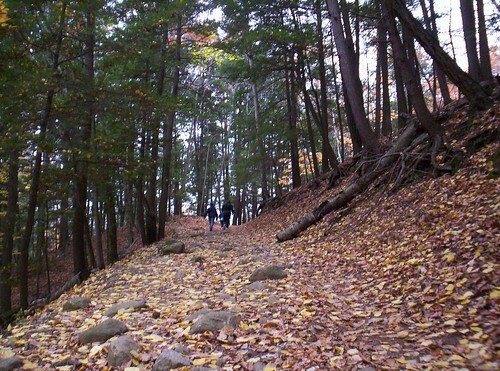 We were looking for a means to go up Mount Defiance (is that what it is still called today?). We found nothing. The signs– what few we found of historical nature– were very worn and almost unreadable and none related to the Mount. I did, however, see many interesting road names: Father Jogues Place, Cannonball Road, Champlain Ave, Algonkin St, Hawkeye Triangle, and even Burgoyne Road! My kids hissed at that! Finding no Mount Defiance entry, we left the solemn little town. 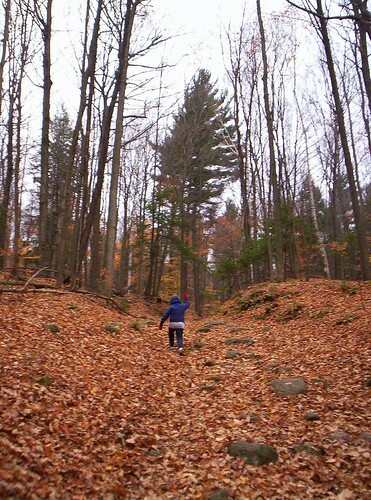 My husband had done his homework and knew of a terrific mountain trail to walk: Buck Mountain. Down Route 9 we went again. The scenery is out-of-this-world. Almost all the kids ooo-ed and ahhh-ed the entire time. Well, my youngest oo-ed and ahh-ed, too, but not because of the scenery but because the twisting curves made him carsick. We stopped on occasion for a breath of fresh air. 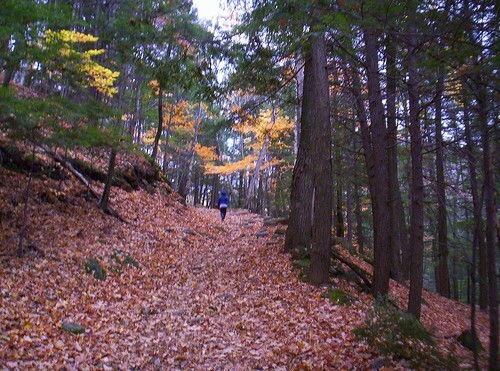 There are numerous public trails and parks dotted up and down Lake George for the public to enjoy. Some are very strenuous, some mild. We chose the milder sort, Buck Mountain. So, back down we went from Ticonderoga. We made a quick pit stop at Bolton Landing. 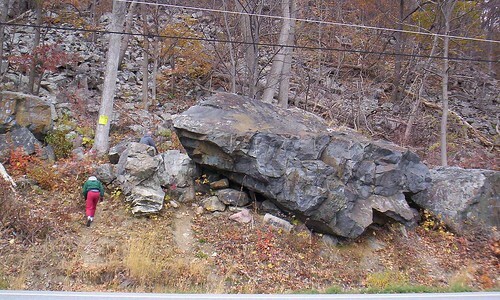 Across from the gas station on the main drag was a huge– and I mean huge– rock– the side of part of a mountain. 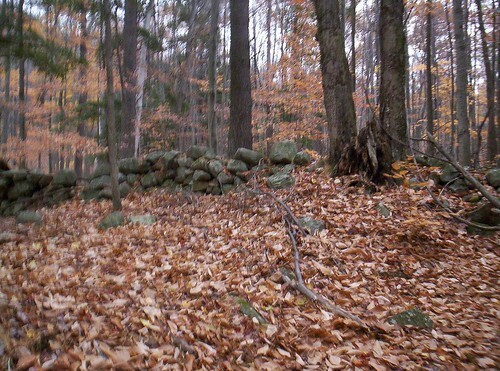 It stood like a 50 foot wall right next to the road. Stores and houses had been built next to it all down the street. The townsfolk probably thought nothing of it, but I was flabbergasted at such a huge cleft of a mountain in the middle of town looming over all the stores. It looked so out of place right there. Such is mountain life, I suppose. We passed through the city of Lake George again (so beautiful, sigh) and drove up the eastern side of the lake. 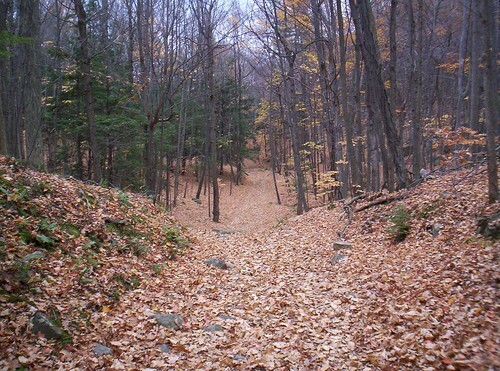 Buck Mountain is situated east of the lake, near Pilot Knob, NY. As I type this, I make our travels sound so easy. It was actually riddled with “Where’s Route 9L? What on earth is Route 9N?” and “You missed the turn again! !” and “You have got to be kidding me! This detour will take us 10 miles out of our way? !” It was a long time spent in that van. We made it to Buck Mountain at 3:30. The skies were very overcast, so darkness would come earlier than the usual 5pm. Surprisingly, there were cars and trucks in the small parking lot– others were here hiking, too! We felt bolder, and decided to give the hike a try. Even though we wouldn’t make it to the summit in time, the journey is half the fun, et al. Before we entered the trail, a wooden box urged us with its white painted letters to register– for “your safety and ours.” Such a good idea! We signed in, picked up one of the complimentary walking sticks left by considerate hikers, and started up. The walking was easy for a while. We even saw one man with his two small children walking up (they later turned around). After about 10 minutes of leisurely walking, the trail got a little more… vertical. And stony. You can see in the pictures how steep the trails became. The entire forest floor was covered with inches of thick oak leaves. These leaves concealed the multitude of rocks. 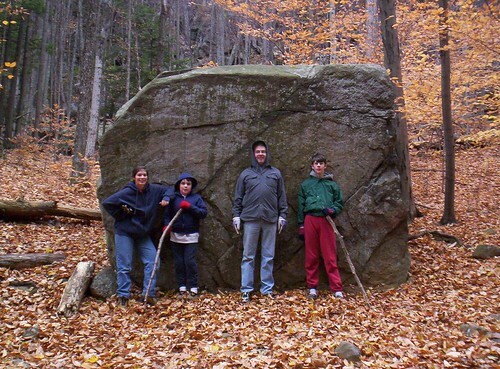 The trail was filled with rocks– big ones! The trails got rockier and rockier. We had to pick our way through carefully. A spill on the trail would not be a pleasant one. But as the trail became steeper and steeper, the rocks became the only things our feet would grab in order to get to the next level. It was quite strenuous, but it was great fun! There was much to see: trees completely shed of their leaves; enormous rocks (house-sized and bigger) that poked out from the leaf-covered sod and stretched yearningly for the sky above. We spied large cracks and crevices in these rocks– caves! I had to practically barricade the area to keep the kids from exploring the caves (the rules were to never leave the trail). They nagged me constantly, begging me if they could see the caves. It was kinda cute, kinda, that they wanted to explore. Secretly, I was restraining myself as much as them. On ocassion we would come to a small creekbed, also riddled with stones. Being a country girl, I daintily picked my way through, but the kids hadn’t had the opportunity for such rugged experiences. A few of them slipped and plunged their shoes into the cold waters. Consider them baptized. We continued to walk as most people were coming down. Everyone was friendly. Two guys in hiking gear stopped to chat with us, and asked us if we were going to the summit. They seemed relieved when we said no, (since we’d never make it back before dark). I asked if there was a good view of the lake from anywhere else but the summit; to my disappointment, he said no. Oh well, there’s always next time! We got up to the one mile mark and checked our clocks: 4:15. we had to turn around and get down before dark. Everyone else had left the trail. We headed down. Darkness was coming much quicker than our pace. We started trotting. The sun dropped and darkness fell; we started running. Finally, we reached the end of the trail. Groping in the dusk, I sloppily signed us out of the registry, to assure others that we made it out and didn’t need rescuing. What a trip! It was exhilarating! Hopefully, next year we’ll make it to the top, and I’ll have a new camera for crispy clear photos. All in all, a great trip. And the kids slept like babies that night. In an interesting afterthought, we traveled though Saratoga Springs. It was dark, but the city was lit up like Las Vegas. I don’t think I have ever seen such an extravagant and squeaky-clean city in New York State. It was fascinating– small cafes with tables and chairs and wandering people enjoying the nightlife; hundreds of glistening white Christmas lights strung across tree-lined parks; manicured shrubs adorning cobblestoned sidewalks. What an interesting city. It was a long drive home, and rain pelted our windshield for most of the drive. We comforted ourselves with plans for next year: plans to go camping and hiking in these lovely mountains that had so readily endeared us to them. it was a pleasure to read about others enjoying my old neighborhood. i made a trek over buck mtn one time looking for a plane that had crashed nearby the night before. my cousin and i came up from the other side of the mountain. we were about 17-18 years old at the time. when we started up from shelving rock area, there was only a dusting of snow. as we neared the top the snow had deepened to our waists. looking back, it was really a miserable trek. trodding through such deep snow took all the fortitude we could muster. reaching the summit, we could see helicopters circling the next mountain to the south. we were so tired that we didn’t think we could make the trip back down to shelving rock, so we took a quite fast trip (sliding much of the way in the snow). we then had to hitchhike the many miles back to shelving rock to get our car. the summit is worth the trek. you can see nearly all of lake george and surrounding areas in a nearly 300 degree view. on a clear day you can see many, many miles to the south and southwest. it is my favorite place, and i have returned many times. it was while sitting in the clearing at the summit,(maybe a 10 acre area at the time) that i made my final decision to move to florida. it was required only due to the lack of employment there. i will always miss this very special area. between the land, the history, and the people, i doubt there is a more wonderful place to live. It’s a shame that New York’s business policy is driving so many people from our state. God help us, this has got to stop sometime. Glad you enjoyed your partial trek up Buck Mt. trail. We live 1/2 mile north of the trail head and know the area pretty well. Had you taken a right turn approx 1/4 mile up the main Buck Mt. trail it would have taken you to Stewarts Ledges as known by the locals in 1/2 hr. and the views of the Lake are great for a short walk. Not as nice as the top of Buck but great for a short hike.